From John R. Bradley, the Middle East correspondent and writer who correctly predicted the Egyptian revolution, comes a new message about the Arab Spring: “everything we have been told about it is wrong”. John R. Bradley sat down with Reza Akhlaghi to discuss his latest book: After the Arab Spring: How Islamists Hijacked the Middle East Revolts, Published by Palgrave Macmillan. 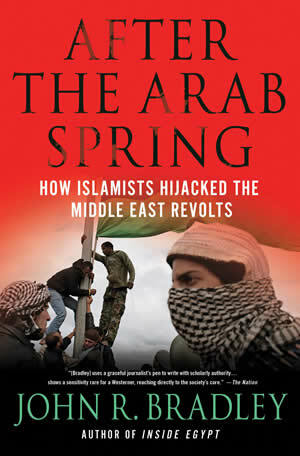 Your book paints a bleak picture of what is coming the Middle East’s way following the Arab Spring. Much of what you say in your book runs counter to Robin Wright’s overarching argument in her acclaimed book ‘Rock the Casbah’, in which she essentially says that Arabs increasingly defy religious extremism and the doctrines of Islamic fundamentalism as espoused by Bin Laden and Ayatollah Khomeini. Whereas in your book, in sharp contrast to Wright’s, you argue that what will emerge from current developments in the region is Islamic extremism and wholesale defeat of the liberal and intellectual class in the Arab/Muslim world. Can you elaborate on this central argument? I wouldn’t dispute the assertion, however odd it might be, that “Arabs increasingly defy religious extremism and the doctrines of Islamic fundamentalism as espoused by Bin Laden and Ayatollah Khomeini.” In fact, I would argue–and always have argued in my books–that the vast majority of Arabs have never had any interest in being terrorists, and that it’s patently absurd, to the point of being offensive, to suggest otherwise even rhetorically. Moreover, what exactly did Bin Laden and Khomeini have in common? Precisely nothing as far I can see. In any case, even to accept that argument does not by default mean we should assume Arabs are embracing the classic Western values of liberalism, pluralism, and freedom of expression. That’s an almighty conclusion to jump to, and it has no basis in logic. It’s like saying because they believe the sky is blue they, by extension, believe that sand is orange. Moreover, the argument is just hot air anyway, because it’s not justified by any of the facts on the ground. For a start, these revolutions–or more accurately these lousy failed revolutions and military coups–were not motivated by a thirst for free-and-fair elections, but by economic desperation and the question of personal dignity. Now, obviously, no one wants to be tortured for speaking his or her mind, whether they are in Paris or Tunis. But to suggest that people of other cultures who speak other languages and have other belief systems and distinct social and political histories merely want to be like us in the West is far too simplistic, and to me smacks of cultural imperialism of the kind that the likes of Robin Wright are always guilty of. Why on earth wouldn’t they want to be just like us? But they don’t. And perhaps, just once in a while, we should have the humility to ask: why on earth should they? In Tunisia you will find almost no one who has a bad word to say about Habib Bourghiba, the authoritarian post-independence leader who ruled from 1956 to 1987. And in Egypt, Gamal Abdul Nasser–who, like Bourghiba, restricted freedom of the press and democratic and civil institutions–is widely adored. I’ve lost count over the past two decades how many ordinary Tunisians and Egyptians I’ve asked about this, and their responses have always been the same: they are loved because they respected the dignity of their people and were not personally corrupt, and during their rule it was not difficult to bring food to the table. The question of whether or not they were elected has never entered into the discussion. You argue that democracy, not its values, is a great friend of Islamists who may have no regard for democratic values but can greatly benefit from them particularly in the form of strong voter turnout who, based on your assertion, are the most active segment of the electorate in the Arab world. To quote directly from your book “In the Arab world, when the gift of democracy is unwrapped, it is the Islamists who spring out of the box”. Once in power, why should Islamists disregard democracy and derail the democratic process in their respective countries with no fear of socio-economic consequences particularly in an interconnected world and an increasingly interdependent global trade system? I don’t argue that there is a contradiction between political Islam and the democratic process. I don’t in fact see any contradiction at all between the two. Have democratic elections not been a reality in Iran for the past three decades? A less frequently asked, but far more pressing, question is whether liberalism and creative dissent, the lifeblood of any culture worth living in, can survive the democratic triumph of Islamist fundamentalism. And the answer, as the case of Iran also tells us, is equally and categorically: no. The Arab Spring marks the last, tragic gasp of any hope for free expression and legal protection of personal liberties in the Arab world, as we understand those concepts in the West. The Islamists are for democracy as a system of government and a method of change but–and here comes the conversation stopper–only insofar as it is compatible with Islam. The Quran remains the sole authoritative basis for legislation, whose earthly manifestation are the scholars who interpret it so that the state’s function is essentially executive in nature. To put it in a nutshell: Islam is the answer to everything, the final authority, and the sole source of legitimacy of government. So ask the Islamists anything about maintining close ties to the West and peace treaties with Israel and they’ll tell you just what you want to hear. But Islamicizing their societies from below, not reassessing foreign policy or banning elections, has always been their top priority, and while they accept for the most part the deomcratic process, they put in safeguards that no legislation can be introduced which contradicts the Sharia (however it is interpreted). On the question of freedom of expression and personal behavior, there is, therefore, always the massive qualifier of “local customs” and “Islamic norms” from the committed Islamists. Consider, for example, the response of Rachid Ghanouchi, the leader of Tunisia’s notoriously moderate Ennahda party, to the violent attacks on secular artists in his country during the past year. “Art is linked to the values and traditions of each society,” he said, “and no one should take away freedom of expression through art, as long as it reflects those traditions (my emphasis).” In other words: provided they do not bulge, or threaten to bulge, or threaten to lead to behavior that bulges, out of the cultural straitjacket of whatever he and self-appointed scholars like him think of as Islam. Why do you think that the Arab/Muslim youth care little for democratic values and that the only reasons they took to the streets were poverty, hunger, and lack of access to descent jobs? Do you think they will get that from the Islamists whom you argue will be ruling them in a new post-Arab Spring Middle East? Let’s look at what’s actually happened during the last year. When the first deadline for voter registration passed in July, a paltry 16 percent of Tunisians had bothered to register. We were constantly told that there was an 80 percent turnout for the elections, but that was 80 percent of the 50 percent who eventually registered after the deadline was extended. In other words, there was a 40 percent turnout. In Egypt in March, there was a turnout of just 41 percent for a crucial referendum on a new constitution that would determine the country’s future. Again, that’s 41 percent of registered voters, meaning–because millions of Egyptians aren’t registered–only about 20-25 percent actually turned out. An extensive study by researchers at Oxford University last month found that only 16 percent of Libyans are now in favour of Western-style democracy, as opposed to 60 percent who prefer authoritarian rule. There are two reasons this reality is not reflected in the Western media’s appalling coverage of the so-called Arab Spring. The first is that, because of the continued influence of Edward Said’s Orientalism, no one wants to sound like some reactionary old Orientalist labeling the Arabs as culturally and politically distinctive, because it easily lends to charges–however unfounded–that they are being labeled inferior. The second is that the Western “experts” like Robin Wright home in on a tiny little band of English-speaking bloggers, activists, human-rights campaigners and so on. The Muslim Brotherhood always dismisses this group as “an out of touch, irrelevant, Westernized elite;” and while I don’t usually have much time for what the Muslim Brotherhood has to say, on this question they are absolutely right. In Egypt, for example, the parties set up by the revolutionaries got just 2 percent of the vote, as opposed to 77 percent for the Islamists–25 percent of which went to the Salafi party,Al-Nour, that openly campaigned on the promise of doing away with elections if they were voted in. In the face of all this overwhelming evidence to the contrary, how much longer can the absurd happy-clappy, Facebook, picnic-in-the-park narrative of the Arab Spring continue? I suppose until all the pundits who got it completely wrong from the outset have no choice but to admit the fact. And that means it will likely continue forever. But now that it’s obvious the revolutions have created a security vacuum and clearly failed to alleviate the economic woes and human rights abuses that spawned them—indeed, in the case of Egypt and Tunisia, quite the opposite—the Islamists offer something seductive in the absence of meaningful solutions: a simple answer, Islam is the solution. The Islamists certainly don’t have viable economic policies. But nor do those in charge of Western democracies. In Tunisia and Egypt before the Arab Spring, youth unemployment was about 30 percent. But in Spain it was 50 percent, and in Greece, Italy and Portugal it was 45 percent. How then was a quick and messy transition to democracy ever going to solve that problem, whoever was elected? The Islamists instead offer solace in the face of these frankly insurmountable problems. The terrible price that the ordinary people of these countries will have to pay for that solace will only gradually become evident to them, as it did to the historically very liberal and tolerant Iranian people. I guess this could be called the $4 billion question, both literally and metaphorically. What was the rationale for the Saudi leadership, as you claim in your book, to give $4 billion to the new post-Mubarak military regime in Cairo? You also assert that this infusion of cash was followed by “indirect threats” to the interim military regime. What were some of those “threats”? Actually, while they promised $4 billion, only about $500 million has materialized. There’s nothing odd in that. Only about 10 to 20 percent of aid ever pledged by any donors for whatever cause ends up being sent. The Saudis were only interested in gaining leverage, and one way of doing that is by holding out the carrot of economic aid for the bankrupt military to run after. Then, as you suggest, there’s the stick. This mainly came in the form of threatening to change the kingdom’s labor laws in a way that would have resulted in the expulsion of millions of Egyptian expatriate workers from Saudi Arabia, which would have had an immediate and devastating impact on the Egyptian economy. That didn’t happen, either. In any case, the Saudis can now relax: the Egyptian military clearly is not in any way itself revolutionary, and the Wahhabis have installed, through extensive funding, their Muslim Botherhood and Salafi proxies in Egypt’s new parliament. One thing we can be certain of is that they will not offer a peep of criticism of the Saudi regime. They never have. In the new evolving Middle East to be soon dominated, based on your assertion, by Islamic fundamentalists, will and should Israel’s strategic objectives and security calculus change? At the beginning of the Arab Spring, Israel breathed a sigh of relief. Tunisia doesn’t matter geopolitically one way or another, but Egypt of course does. And in Egypt there was a military coup. The Egyptian military is very pro the 1979 peace treaty with Israel, and its army is funded, trained, and equipped by America. The triumph of the Islamists in Egypt’s parliamentary elections doesn’t change things much vis-à-vis Israel, at least not in the short term. The parliament has limited powers, and all this talk about the Muslim Brotherhood taking on the military to push them to hand over to civilian rule is nonsense. With real power comes responsibility and accountability, and while the Muslim Brotherhood may be many things, one thing they certainly are not is stupid. As I’ve already suggested, with the cleanest, most efficient government the world has ever known, it would take a generation or more to cleanse the country of its corruption, brutality, poverty, illiteracy, chronic unemployment, nepotism, and so on. This is one reason the Brotherhood are more interested in forming a coalition with the liberal block in the new parliament than with the Salafis: that way, when the next elections come round, they can blame the liberals for the ills that still plague their nation. And the Brotherhood will avoid direct confrontation with the military because their first priority is not the defense budget or launching wars but imposing Islamist dogma on the Egyptian society, and that is what will preoccupy them during the first parliamentary session. More generally, Israel is putting all its hopes on its undeclared and bizarre, but very real, alliance with Saudi Arabia, which, despite spewing anti-Semitic venom of the kind not seen since the Nazis, poses no military threat to the Jewish state. The Saudis are also aligned with Washington and hate the Iranian mullahs like the plague. Along with Qatar, Saudi Arabia has led a region-wide counterrevolution, shoring up pro-Western Persian Gulf monarchies as well as those of Jordan and Morocco, and backing the Muslim Brotherhood and its franchises in Tunisia, Syria, and Yemen. The question we can’t answer at this stage is whether the Saudis, through their funding and Wahhabi doctrine, will be able to control the Islamist groups taking power everywhere in relation to their relations with the West and Israel, in the same way the House of Saud has more or less been able to control their own Wahhabi religious establishment. Do you think a new Middle East dominated by Sunni Arab governments will experience a Sunni-Shiite conflict? On the government level yes. The main reason Washington has backed the Saudi-led counterrevolution, which is to say the move by Sunni Islamist parties to fill the post-Arab Sring vacuum, is to contain Iran. But ordinary Arabs have little time for such distinctions, despite the anti-Shia propaganda campaigns they have been bombarded with over the past five or so years. If Israel and America attack Iran, ordinary Arabs will side with the latter. It will be interesting to see how the Saudi- and Qatari-aligned Sunni parties throughout the region will try to box themselves out of that corner. What, in your opinion, would it really take to see Kant and Sartre being taught at Saudi universities? A miracle of the kind the world has never seen before.